This week's guest is famous for one pitch that changed his life forever. The pitch was a 92 mph, first pitch fastball to the back of the head on his major league debut with the Chicago Cubs. This unfortunate event gave Adam the record for being only one of two players in history to have an official at bat without ever taking the field. After seven years of continued hustle to get back to the major leagues, battling post-concussion symptoms and countless other injuries, he signed a one day contract with the Miami Marlins in 2012 to finish that at bat. Adam was an All-American at the University of North Carolina at Chapel Hill and was inducted into the National Jewish Sports Hall of Fame in 2014. 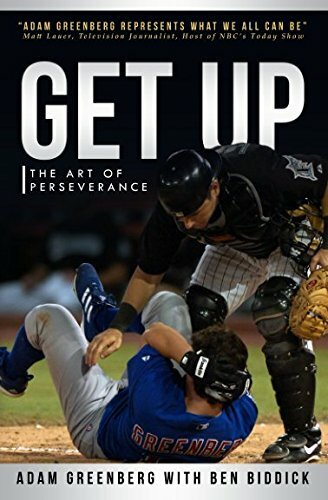 Outside of baseball Adam founded the Health & Wellness Company Lurong Living and is author of the book “Get Up, The Art of Perseverance.” Adam's book should be a must read for any athlete who is dealt adversity, especially if they are struggling with post-concussion syndrome. I was first introduced to Adam's story through my buddy Joe who hired Adam to speak to the athletes at NJIT. After Joe's recommendation and reading Adam's book I knew I had to get him on the pod. I apologize in advance for dips in audio quality throughout this episode, but luckily Adam was kind enough to re-record the roughest parts. Why baseball is a game of failure. The odds against baseball players reaching the major leagues. Weight room accident that kept him out of for the first time baseball and how Adam dealt with it. How your attitude can create opportunity. How to make fuel for your fire with the naysayers. Symptoms from the concussion suffered in Adam's first major league at bat (17 mis-diagnosis). The different treatments that helped alleviate his symptoms. What is was like going through this injury in the early years of concussion awareness. How to make injury recover a game. How Adam's mental game got stronger after each setback. The importance of setting small goals along the injury recovery journey. The one at-bat campaign story. How pain can serve as a teacher. Why if you quit, you are no help to anyone. Adam's transition to life after baseball and how Lurong Living helped this transition. The injury that gave Adam closure. Adam educate's us on deer antler supplements. Adam's latest project with Four Diamonds Sports. WHERE CAN YOU connect with Adam Greenberg? Where can you learn more about Lurong Living? Ryan Westmoreland was a 5th round draft pick by The Boston Red Sox out of high school in 2008. Ryan had a phenomenal rookie season with the Lowell Spinners of the Class A-short league where Ryan batted .296 with 7 home runs, 35 RBIs and a .401 on base percentage in 60 games. Unfortunately, a Cavernous Malformation in his brain cut his pro baseball career short, but he is lucky to be here to share his story with us in episode 126. What a cavernous malformation is and why Ryan's was in the worst possible spot. Symptoms he experienced during spring training that led him to think something might be wrong. Ryan takes us through the surgical and rehab process. Ryan's determination for blazing a trail back to professional baseball after surgery. Fighting through the frustration in his return to pro baseball. Struggled with fine motor skills. Setbacks that led to surgery #2. Taking it day by day through the bad days. What went into the decision to retire. How Ryan's adversity influenced his coaching today. Why Ryan's health is his number one priority today. Battling the thoughts of "why me?" Where his interest in fitness came from. How Ryan's athletic performance benefitted from playing multiple sports through high school. WHERE CAN YOU CONNECT WITH Ryan? My name is Emily Allard and I am a professional softball player out of Chicago. I grew up in the Bay Area and went to school at Northwestern. I had four surgeries in college, two more in the pros, but about 18 months ago my life was turned upside down when I sustained my second concussion. I haven't been the same since. The story of Emily's first concussion sustained while pitching back in 2008 and the recovery from that injury. How a broken thumb programmed “toughness” in her. Why there will always be certain situations where concussion protocols don’t seem to exist (unfortunately). The story of Emily's second concussion that has left her with chronic PCS symptoms and the extreme isolation and frustration that has ensued. Discussion of the 6 surgeries (non-concussion related) Emily has overcome in her athletic career. The differences in concussion management and treatment between 2008 and 2016. Specific symptoms Emily still struggles with to this day – vision (depth perception), eyes tracking side to side, elevated heart rate, headaches, cognitive (stuttering, forgetfulness, dropping things). "Everyone is facing their own silent battles." Thoughts feelings and emotions surrounding her symptoms. Why doing more isn’t going to make it better, which is the opposite of training in sports. What happened when Emily tried to play through her symptoms. Why pro softball players might want to consider unionizing. How most of Emily's injuries stemmed from overuse and not listening to her body. The frustrations with lack of a specific protocol in concussion recovery. Pushing through injuries that lead to other injuries. How basketball kept Emily healthy. The role of the slapper in softball and the creativity that role requires. The value of seeing sports psychologist, especially while injured. Emily's passions outside of softball such as yoga and paddle boarding. Weighing the risks and benefits of returning back to softball in pursuit of a life-long dream. Why Emily plays for the kids. Advice to athletes going through what she is going through. WHERE CAN YOU CONNECT WITH Emily?